Eduardo Barraza is an Arizona-based journalist, the founder and director of HISI, and the editor of Barriozona Magazine. He and his wife Yolie Hernandez have been involved with Xico for years so I’m excited to (virtually) sit down with Eduardo to talk about his new book Sophia Remembers, Day of the Dead. Can you tell us a little bit about the Hispanic Institute for Social Issues and your work at Barriozona? I founded HISI in 1998 to expand my horizons as a journalist, writer and photographer. What resulted later was a grassroots multimedia agency to publish information on social issues and about the Latino culture. Since then, HISI has published more than 45 books and one DVD. Barriozona Magazine is our on-line, bilingual site where we have multimedia information –articles, videos, and slideshows– on issues like immigration, topics as history, and stories on recent archeological discoveries in Mexico, for example. How do you work with the local community? Other artists? Arts organizations? We have published several books for community-based organizations, schools, and individuals, as well as provided them with the same multimedia services as the ones we utilize to create our own material. We also participate in cultural events like Xico’s Day of the Dead annual festival. We do what we can to promote local artists by publishing stories about them. I began writing when I was a teenager but more seriously as a student of journalism. In a way, I started writing by reading. I’d read a ton of books, magazines, and newspapers. I think that gave me a foundation to understand language and words. Also, genetics may have something to do with this. My grandfather founded and directed a very successful institute with students from all over Latin America and the United States, and he was a very profuse writer. My father wrote poetry as a pastime. One of my uncles wrote scripts for graphic novels. My older sister is an awesome poet. In my case, I chose journalism to express my desire to communicate through the written word. At Day of the Dead events we have participated in Arizona people always come to our booth and ask me about El Día de los Muertos. There’s a huge interest in this holiday because it blends religious and cultural aspects, but more importantly because it also carries a strong emotional aspect since it has to do with our memories and feelings about loved ones who have died: a parent, a sibling, a spouse, a friend. I felt a book containing much of what I have shared in person has the potential to reach thousands around the world. The book is being distributed worldwide, so the possibility is there. Anybody who may have a desire or an interest in learning the true essence of Day of the Dead. 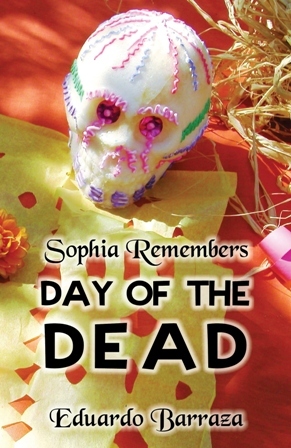 Sophia Remembers, Day of the Dead allows readers to look through a very intimate window and see the way a devote woman remembered her family members as she prepared an altar with much diligence and dedication. Did your family celebrate Día de los Muertos when you were a child? How do you celebrate it now? Yes, my family observed El Día de los Muertos. However, as I explain in the book, there was nothing festive about it. Remembering our dead ones was a sad commemoration, going to the cemetery, crying and feeling sad about a loved one who had died. Of course, for the kids there were the traditional sugar skulls, little skeletons made of chocolate or pumpkin candy. We also ate pan de muerto, or day of the dead bread. So there were tears but also smiles. Today, I celebrate it by remembering family members and friends who have passed away. Are there any similarities between being a photographer and being a writer? For me there are, since I am essentially a journalist. Journalists are always communicating information whether it is through the written word, photography and even video or audio. Each is different in method and technique, but for a journalist they have the same goal, which is to communicate information. Do you have plans for a next book? Yes, through HISI, we have plans to publish at least five more books this year.